VATICAN CITY (CNS) — Christianity has something to say about human dignity, and “it would be a shame” if differing positions on the sanctity of all human life or on marriage were to increase the divisions among Christian churches and communities, Pope Francis said. “Questions related to the dignity of the human person at the beginning and end of life, as well as those related to the family, marriage and sexuality, cannot be concealed or overlooked just because we do not want to jeopardize the ecumenical consensus already reached,” he said Dec. 18 during a meeting with German Catholics and Lutherans. 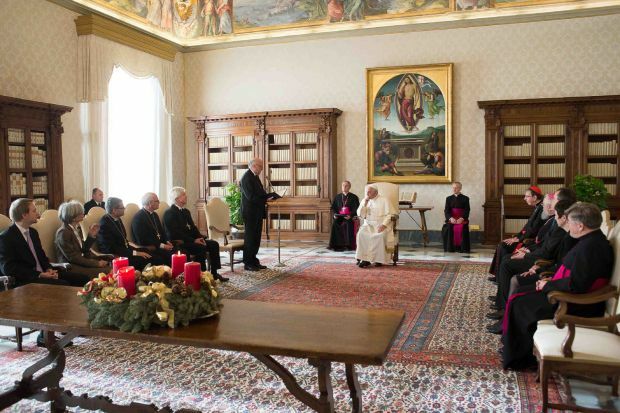 “Ecumenical dialogue today can no longer be separated from the reality and lives of our churches,” the pope told leaders of the German Lutheran Church and members of the German Catholic bishops’ ecumenical commission. Pope Francis praised the German Catholic-Lutheran dialogue commission for its joint study on “God and human dignity,” a study which is drawing to a close. The mutual esteem, the recognition that Catholics and Lutherans share the basics of Christian faith and that they can pray together, he said, will determine how they mark together the 500th anniversary of the Protestant Reformation.